Wild: Castoroides is a large, mammalian herbivore that tends to live near water. Unlike other larger beaver species this one retains the chisel-shaped teeth of modern beavers. 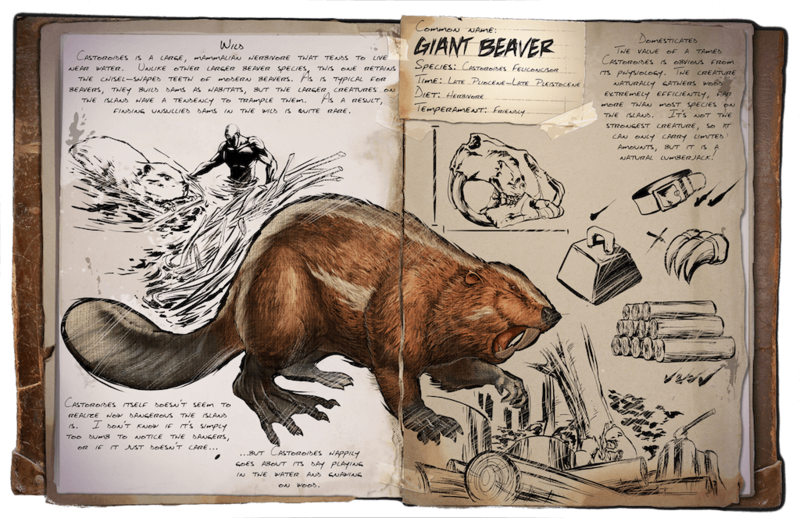 As is typical for beavers, they build dams as habitats, but the larger creatures on the island have a tendency to trample them. As a result, finding unsullied dams in the wild is quite rare. Domesticated: The value of a tamed Castoroides is obvious from its physiology. The creature naturally gathers wood extremely efficiently, far more than most species on the island. It’s not the strongest creature, so it can only carry limited amounts, but it is a natural lumberjack! Known Information: Castoroides itself doesn’t seem to realize how dangerous the island is. I don’t know if it’s simply too dumb to notice the dangers, or if it just doesn’t care…but Castoroides happily goes about its day playing in the water and gnawing on wood.